Protecting human rights while countering violent extremism and radicalisation leading to terrorism (VERLT) in the prison context was the subject of a side event organised by the OSCE Office for Democratic Institutions and Human Rights (ODIHR) and Penal Reform International (PRI) in Warsaw on 18 September 2017, during the annual OSCE Human Dimension Implementation Meeting (HDIM). Event participants, including a panel of experts from France and Kazakhstan and representatives of PRI and UNODC, explored and shared information about human rights issues arising from practices aimed at tackling VERLT in prison. Panelists and participants raised concerns about overall prison conditions in the OSCE region. They stressed the need to ensure humane, safe and secure conditions for all prisoners and the importance of a human rights-based approach to managing, reintegrating and rehabilitating violent extremist offenders. The outcomes of the event will inform the ongoing activities of ODIHR and PRI to promote respect for human rights while countering VERLT in prisons. 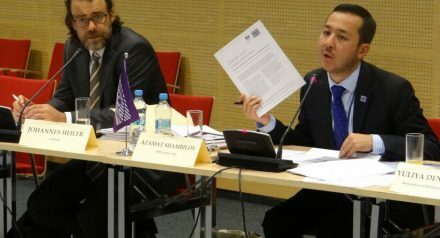 Photo: PRI’s Central Asia Regional Director, Azamat Shambilov, speaking at the event. This article has been reproduced from the original on OSCE’s website.